The first time I encountered Foot Foot was over the phone. My boyfriend at the time, Wade, had called me to tell me it was important that I come over right away. I heard a tiny "mew" in the background when he told me this. This was the first mew I'd ever heard from his end of the phone and I was pretty sure it wasn't him. I drove over straight away. Foot Foot came from the Livingston County, Michigan Animal Shelter where they only numbered their cats instead of naming them. Wade told me there was a sign on the wall asking people to specify when dropping animals off whether it was okay to donate them for testing or not. Her receipt read kitten...$5.00...carrier...$3.00. Foot Foot was a scrappy little kitten and when I first met her I didn't think she was that cute. She looked kind of spare and rumply to me, and was one of the tiniest cats I'd ever seen come home. 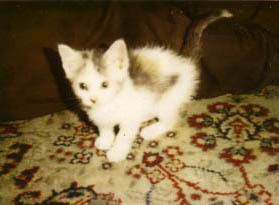 She was adopted at only five weeks, the tiniest girl out of a litter of brothers who picked on her in her cage. She was so small she couldn't make it from Wade's bed to the bathroom in the short time she took to realize she had to pee. She didn't have a name for a little while, but soon our friend Brad called up and left a message on an answering machine decreeing that she would heretofore be known as Foot Foot. It stuck. Her favorite toy as a young kitten was a record crate. You may recall the wooden crates you used to be able to buy at all the chain record stores, standard crates with slats of wood set a little less than two inches apart. Wade had one that stood on end as a bookshelf in his bathroom, and baby Foot Foot loved nothing more than to run in circles through the gaps between those slats. For those who knew her as the large and in charge adult kitty she was, this recollection may seem incomprehensible to you. Foot Foot grew bigger and in time we introduced her to my cat, Woodward. Wade and I decided they might enjoy keeping each other company while we went out of town on Thanksgiving, and from then on Foot Foot and Woodward were buddies, or at least buddies when it was cold outside and you needed another kitty to snuggle on. Foot Foot essentially moved in with Woodward and I in Ann Arbor, where she particularly enjoyed running out into the hallway of my apartment house whenever the door opened. I would usually just let the door shut behind her, and a few seconds later I'd open it and she would run back in. When Wade and I parted romantic ways I insisted upon taking her. To lose such a great cat along with my boyfriend would have added injury to injury. He kindly relinquished her, and soon enough I would abscond with Foot Foot to Canada to avoid the draft. Foot Foot and Woodward seemed to enjoy living with me again and particularly liked the large front window of my new West Toronto apartment, which looked out onto a fairly bustling garden and a busy street. 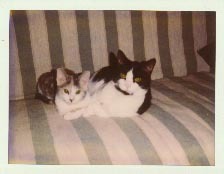 I installed metal venetian blinds for privacy when I moved in, but a 5"x5" hole was quickly forged by repeated bending and eventual breaking by both cats, though mostly Foot Foot. I should mention that around this time Foot Foot had gotten quite large. Fat, really. She weighed in at at least 12 pounds at that stage of life; at her maximum she was probably 16 or 17. I often worried about diabetes, but found it hard to make her stick to her workout. I nicknamed her Food Food, Food Ball, and Food Court at this time, though I should point out that plain old cat food was really all she was ever interested in. One hot summer day–one of the hottest in my residence in Toronto–I came into my living room to find my worst fear realized: my front door was wide open. I quickly shut it and did a cat inventory. Woodward was sleeping on the floor, unconcerned. Foot Foot wasn't there. I opened the door again to go look for her and she casually sauntered inside. I have no idea how far she got or how long she was out there (probably not far and not long), but I was always grateful that she went outside on such an unpleasant day she wouldn't yearn to break out on a regular basis. In 2001 Foot Foot and Woodward and I moved into a house with Jeff. Because we were painting and having work done, she didn't get to see much beyond the upstairs bathroom for a month. When she and Woodward came out for the first time, though, they did a thorough check of the premises. We learned quickly that Foot Foot was a speed demon on a set of stairs, and regularly watched her tear up and down at incredible speed, despite being quite blessed in girth. In late 2003 Jeff and I came back from a vacation to find Foot Foot purring at maximum strength. We initially thought her treble-y symphony was out of sheer delight at seeing us again, but gradually learned that she was noisy all the time, and she was soon diagnosed with asthma. Foot Foot underwent a few rounds of medication, including steroids (for a 17-pound cat!) in order to treat her condition, which sometimes got better, and sometimes worried us greatly. Either the desire for different air quality or the excitement of steroids drew her to seek out a sleeping space at the top of the kitchen cabinets, just above the highly-cluttered top of the fridge. To this day I have no idea how she got up and down from there every day without ever breaking a single thing. 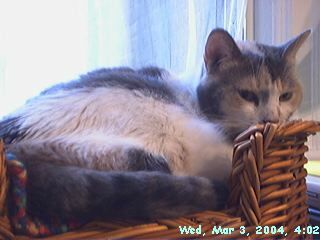 We attempted to put Foot Foot on a diet in early 2004 and thought it was working despite my growing suspicions that something was amiss with her. She lost pound after pound and our vet suggested she shouldn't lose any more, or he would be concerned. She lost three more pounds without us really noticing, and at Jeff's mom's prompting we took her in to see the vet in May. He quickly located a mass near her thyroid gland, and hopes were high that the lump would be a fairly common benign tumor that was impeding her thyroid function. Surgery was ordered and our worry grew high. The day we took her in for surgery, the vet found another mass, in her abdomen. Cancer was the most likely suspect. She survived the operation, which just excised the thyroid mass, but the biopsy came back with the sad news: she had Lymphoma, and probably only a month or two to live. She would not make it to her eighth birthday. As Foot Foot declined rapidly our affection for her only grew. To watch her do a tiny normal cat-thing became monumental. She could still play fetch, if weakly, and though it became harder and harder for her to jump up, she still tried. Towards the end, she preferred sleeping on an old U-Haul blanket in the basement, but I brought her to bed with us most nights anyway. For weeks we would do this, Foot Foot waiting until we'd both fallen asleep before getting up to wander off somewhere more private. She usually woke me up when she did this, though I tried not to let her know. In early July we took Foot Foot out into the garden to experience the outdoors for the second time in her life—this time with permission. She was too tired and weak to go far, but she spent a couple of hours lounging around with all the different smells and sounds, moving from shade to sun and back again as she desired. Two days later she fell so sick we decided to have her put to sleep the next morning. That night, as I held her on my chest and petted her, I knew we wouldn't need to. I stroked her gently and talked to her until about 2:00am, then set her down gently between Jeff and I and rested her head on a small pillow the way she liked. I woke up at 4:30, and she had passed away. Just as in weeks past, she had kindly waited until we were asleep to take her leave. It's impossible to tally the moments of kindness and cuteness and amazement Foot Foot brought. She was an excellent fetch player and an international internet sensation, who regularly received fan mail from people she didn't even know, oceans away. She purred at everybody and would hold quite a conversation with you in the bathroom. If you visited her and tried to leave, she'd flop down in front of the doorway to prevent you from doing so. No pillow or person's stomach was ever soft enough for her, and she'd knead these with her paws until you made her stop. She was naughty and tried to sleep in sunbeams on the counter all the time, and oftentimes I let her. Without Foot Foot the world is not as good a place.